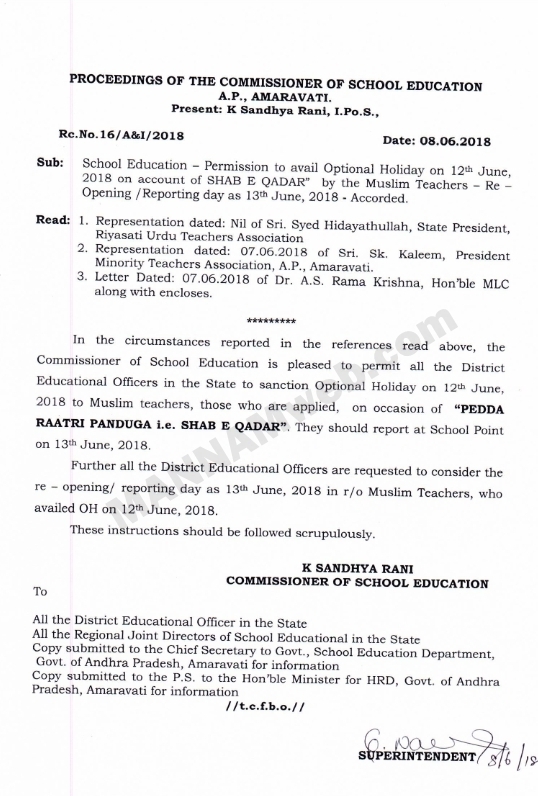 School Education - Permission to avail Optional Holiday on 12th June 2018 on account of SHAB E QADAR" by the Muslim Teachers - Re -Opening /Reporting day as 13th June, 2018 - Accorded. Minority Teachers Association, A.P., Amaravati. 3. Letter Dated: 07.06.2018 of Dr. A.S.Rama Krishna, Hon'ble MLC along with encloses. 2018 to Muslim teachers, those who are applied, on occasion of "PEDDA RAATRI PANDUGA i.e. SHAB E QADAR". They should report at School Point on 13th June, 2018. Further all the District Educational Officers are requested to consider the re - opening/ reporting day as 13th June, 2018 in r/o Muslim Teachers, who availed OH on 12th June, 2018.